As a result of Alberto Ascari's accident the previous year, the Monaco chicane had been altered so that a repeat of the crash would be less likely in the future. 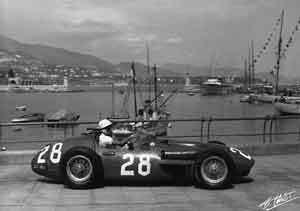 In the four months since the Argentine GP the Lancia-Ferrari, Maserati, Vanwall and Gordini teams had been developing their cars and they were joined in Monaco by BRM although engine problems in practice meant that neither Mike Hawthorn nor Tony Brooks would be able to start the race. The cars were also a long way from the pace, Hawthorn lapping the track five seconds slower than Juan-Manuel Fangio's Lancia-Ferrari. Stirling Moss was alongside his old Mercedes-Benz team mate on the front row with Eugenio Castellotti completing the front row in his Lancia-Ferrari. Then came Jean Behra's Maserati and Harry Schell in the first of the Vanwalls. The third row was a similar mixture with Maurice Trintignant in the second Vanwall, Cesare Perdisa in a Maserati and Luigi Musso in another Lancia-Ferrari. Peter Collins - Ferrari's fourth driver - was back on row four but he was three seconds a lap clear of the Gordinis and privateer Maseratis at the back of the field. At the start Moss took the lead with Castellotti, Fangio and Schell hot on his trail. It did not take long for Fangio to pass Castellotti but Moss was five seconds clear by the end of the first lap. At Ste Devote on the second lap Fangio made a rare mistake and spun. While some the cars arriving on the scene were able to get through, Schell and Musso both went off into the haybales and were out. Fangio rejoined and tried to make up for lost time. Castellotti ran into trouble early and retired with clutch trouble and when Fangio passed Behra he was third. Ahead was Collins and he quickly moved aside to let his team leader through so that Fangio could chase after Moss. The Argentine driver was not having a good day, however, and after clouting a wall at the chicane he pitted and handed his car over to Castellotti. Just after the halfway point Collins was called into the pits and Fangio took over his car - an odd move in the circumstances. Fangio had obviously regained his composure because he quickly caught and passed Behra and then set off to close the 45 second gap to Moss. He had 30 laps to do it. Fifteen laps later Moss had a fright when lapping his team mate Perdisa, who suffered a brake failure just as Moss was passing him. The two cars made contact and Moss damaged one of the catches which secured the bonnet of his car so that it was lifting up slightly in some of the corners. Moss remained calm despite the fact that Fangio was closing at two seconds a lap and he got to flag with six seconds to spare.